A highly polymorphic core collection of bread wheat and a more narrow-based breeding material, gathered from pedigrees of seven modern cultivars, was analysed in order to compare genetic diversity indices and linkage disequilibrium (LD) patterns along the chromosome 3B with microsatellite (SSR) and Diversity Arrays Technology markers. 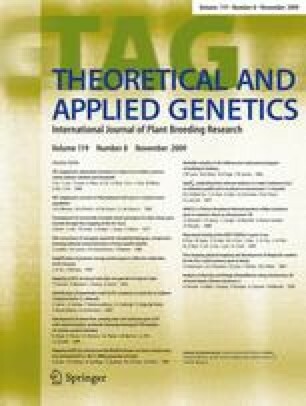 Five ancestral gene pools could be identified within the core collection, indicating a strong geographical structure (Northwest Europe, Southeast Europe, CIMMYT–ICARDA group, Asia, Nepal). The breeding material showed a temporal structure, corresponding to different periods of breeding programmes [old varieties (from old landraces to 1919), semi-modern varieties (1920–1959), modern varieties (1960–2006)]. Basic statistics showed a higher genetic diversity in the core collection than in the breeding material, indicating a stronger selection pressure in this latter material. More generally, the chromosome 3B had a lower diversity than the whole B-genome. LD was weak in all studied materials. Amongst geographical groups, the CIMMYT–ICARDA pool presented the longest ranged LD in contrast to Asian accessions. In the breeding material, LD increased from old cultivars to modern varieties. Genitors of seven modern cultivars were found to be different; most marker pairs in significant LD were observed amongst genitors of Alexandre and Koreli varieties, indicating an important inbreeding effect. At low genetic distances (0–5 cM), the breeding material had higher LD than the core collection, but globally the two materials had similar values in all classes. Marker pairs in significant LD are generally observed around the centromere in both arms and at distal position on the short arm of the chromosome 3B. Communicated by H. H. Geiger. The online version of this article (doi: 10.1007/s00122-009-1153-8) contains supplementary material, which is available to authorized users. The authors are grateful to P. Sourdille for providing CFA, CFB, CFE microsatellite primer pairs and thank Genoplante Consortium, RAGT and Syngenta firms for GPW, WMM and NW microsatellite primers, respectively. This work is part of the SDD project (Semences De Demain) which has been financed by the “Industry competitiveness Fund” of the French Ministry of Industry (http://www.competitivite.gouv.fr) and labelled by the pole “Céréales vallée” (http://cereales-vallee.org/). It is also a part of the EXEGESE project founded by NRA (French National Research Agency).